Millennium 7 Publishing Co.: Adjusting YOUR Business Social Media Presence? Adjusting YOUR Business Social Media Presence? Businesses must keep adjusting social media presence..
As we roar into the spring of 2018 it is a good time to take stock of your corporate brand. What does the sign in front of your office say about the company? Does it say we need to invest in some painting? What does your website say about your brand? 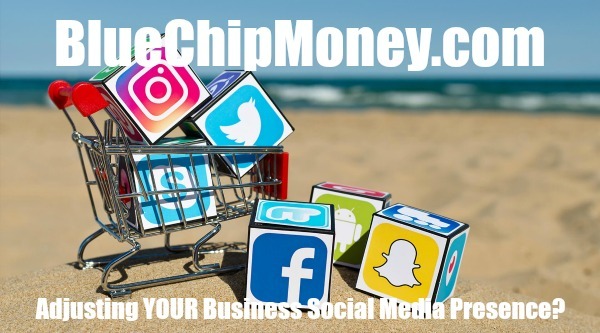 How about your social media presence? Make sure you are not one of those users on Twitter that have a blank icon. If you are not comfortable with your picture, consider getting a new professional one done or use your company logo. I had lunch with Ben Graybar from Hancock Bank last week and we started chatting about Linkedin. After lunch, he posted one of my columns on his page and three days later it had over 3,000 views. That is some serious no-cost branding. LinkedIn breaks down the analytics so you can see who checked it out. According to LinkedIn my biggest audience is City of Tallahassee employee and bankers. TMH employees are also big fans of my writing or maybe it’s Ben’s page? He does have over 5,000 followers. Related Article: Social Media Shape-Up For Job Seekers? He added “LinkedIn provides a great platform for staying omnipresent. Why is omnipresence important? Tri-Eagle Sales is the King of Beers in Tallahassee, and they proudly distribute Anheuser-Busch InBev brands such as Budweiser, Bud Light, Michelob Ultra, Goose Island, and Stella Artois, along with world-class craft and import brands. I spoke with their team about marketing, and Brittany Foster, Communications Manager, had this to say about taking a national Bud Light campaign to our local market; “Tri-Eagle Sales has taken the “Pit of Misery” to the Florida State Men’s Basketball stadium. Consumers could enter to win tickets to the “Pit of Misery” section at an FSU Basketball game by commenting on the “Dilly Dilly! photo on the Facebook page. Tallahassee Chamber of Commerce Communications and Member Engagement Chairman Jeremy Cohen, also of Target Print and Mail, was kind enough to flatter me with some of the silly videos I have put out over the years pushing our brand and services. You will have to go to our Facebook page to judge for yourself if me showing people how to use the Aegis iHorn by blasting Quiet Riot is amusing. Jeremy and the Target team did some cool marketing last year at the Chamber Conference. They gave out Tallahassee-themed bumper stickers to reinforce their branding position as part of the fabric of this community. It was a subtle reminder that they print bumper stickers and other printed pieces like that, but most importantly it showed they were a business that’s local and is committed to this community. Your brand is 360 these days so make sure to have all the bases covered. Have you considered adding your Twitter feed to the front of your website? That way it stays fresh even without you adjusting the content? Do you make videos? Utilize Facebook live? Send out a newsletter via email? Working and branding in this market have always been a blessing. I have lived elsewhere and we are all fortunate to have such a well-rounded community. Perhaps when thinking about marketing you should apply the Hedgehog Theory from Jim Collins book, "Good to Great." Find the intersection of what you are passionate about with what you best at, and what drives your dollar generation. I think the three examples I explored here in our community hit a home run with that. Thank you for reading and I hope this column gave you some inspiration to do something creative with your brand. Signing off until next time, your humble and appreciative biz and tech columnist for the past seven years. Dilly Dilly. Authored by Blake Dowling. Blake is CEO of Aegis Business Technologies. "All things Technology is his business, and he knows many terrible jokes." Follow Blake on Twitter.